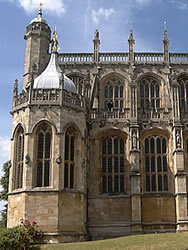 This page introduces the towns of Windsor and Eton. 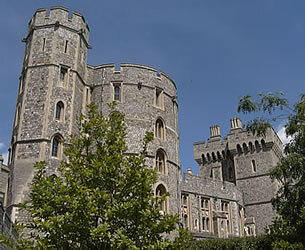 Windsor Castle is one of the official residences of Queen Elizabeth the Second (the others are Buckingham Palace, Sandringham and Balmoral). She is lives here and performs official duties during the month of April and the second week in June (for Garter Day and the nearby horseracing event Royal Ascot: Ideas/Album/RoyalAscot). She also chooses to stay here during many of her private weekends. When the Queen is in residence she often entertains officials in the castle (they enter through the State Entrance). 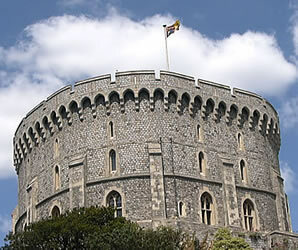 When the Queen is living in the castle you can see the Royal Standard flying on the top of the Round Tower. There are four quarters on the Royal Standard: the three lions represent England (and Wales), the single lion represents Scotland, and the harp represents Ireland. When the Queen is not there, the Union Jack is flown. 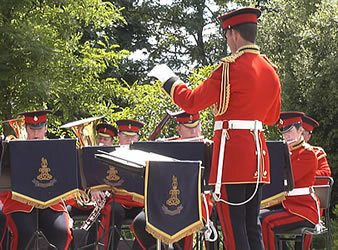 The Bands of the Household Division give free concerts on Sunday afternoons during the summer. The bandstand is located in front of Jubilee Garden. 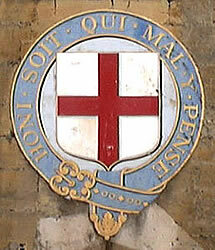 The Order of the Garter was established by King Edward the Third in 1348 as a way of rewarding some of his supporters following successful wars against the French and Scots. It is a group made up of the king or queen and 25 knights which he/she appoints to the order. A popular story is that when King Edward the Third was at a ball in northern France a noble lady (the Countess of Salisbury) dropped a garter and people started laughing at her. The king was angry about this, so he went and picked up the garter and said "Honi soit qui mal y pense", which is French for "Shame on the person who thinks badly about it". This is why the symbol used for this honour is a garter (strap) with this French phrase written on it (see below). In the middle is the cross of Saint George, the patron saint of England. Each June the Queen and Royal Family take part in Garter Day ceremonies at Windsor, including a special service in St George's Chapel. Inside the chapel are the banners of each of the Knights of the Order of the Garter, and a beautiful fan-vaulted ceiling. Many kings and queens are buried there. 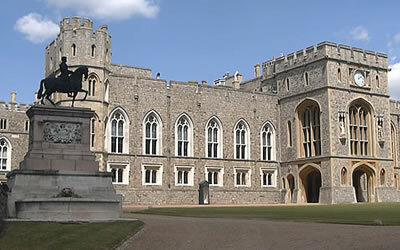 Queen Mary's Doll House at Windsor Castle is one of the world's most famous dolls houses. 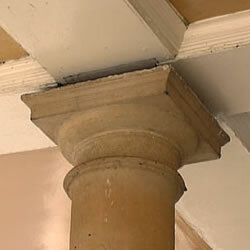 It is about 2m (7ft) high and is a miniature version of a grand Edwardian home (about 100 years ago). It includes electric lights, running water and even a working lift. 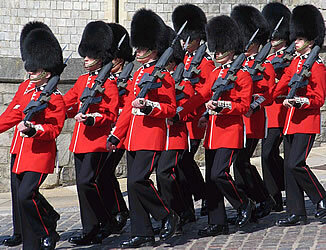 Security for the Queen is provided jointly by the police and the Household Guard. Guard Mounting (sometimes called Changing of the Guard) usually takes place daily Monday-Saturday during the summer (April to June), and once every two days during the rest of the year (not on Sundays). Check times by telephoning 020 7321 2233. 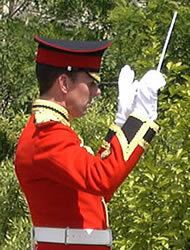 Between 10:45 and 11:00 the new guard leave Victoria Barracks, accompanied by a military band (the Guards Band). They march along Sheet Street, into the High Street, and then turn right at Queen Victoria's statue into Castle Hill and enter Windsor Castle. At 11:00 the new guard takes over from the old guard - this part of the ceremony is usually in the part of the castle called Lower Ward (you need to have bought a ticket for the castle to see this part). 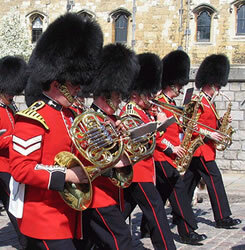 Between 11:15 and 11:30 the old guard returns to Victoria Barracks, using the same route as before. 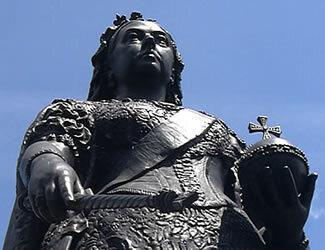 A famous landmark in Windsor is the statue of Queen Victoria at the junction of Castle Hill and High Street. Her husband Prince Albert died in Windsor in 1861. 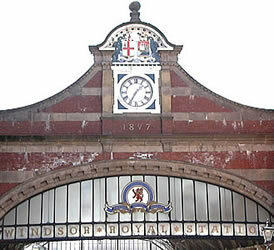 After train services to Windsor were started, Queen Victoria arrived by train at Windsor Royal Station (used now as a shopping centre) and followed a special royal walkway to reach the castle. Located in the Home Park of Windsor Castle, Frogmore House was purchased in 1792 for Queen Charlotte. 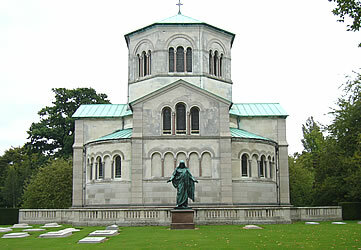 The Royal Mausoleum includes the tomb of Queen Victoria and Prince Albert. Frogmore House is only open to the public on a few days each year (usually during the bank holiday weekend at the end of August and for a few days during the week in late May or early June). 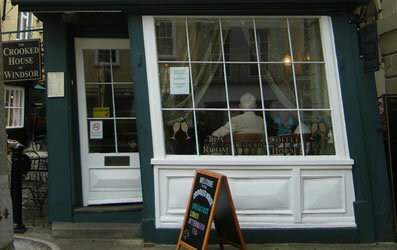 The old town is located immediately opposite Henry VIII Gate (the exit of the Castle). Several of the streets are cobbled. 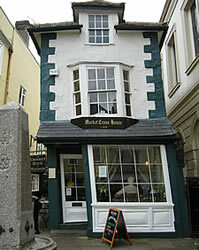 You can have a rest at the tea rooms of The Crooked House. 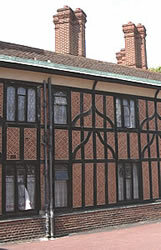 Nearby you can see the shortest street in Britain: Queen Charlotte Street. 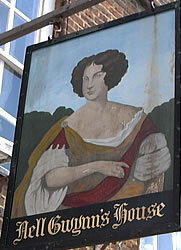 Nell Gwynn (1650-1687) was a favourite mistress of King Charles the Second. She originally sold oranges near the Drury Lane Theatre in London, before becoming a young actress. After she became one of the king's lovers, Nell is believed to have lived either in Pall Mall in Westminster or in Church Street in Windsor (so that she could stay close to where he was staying). King Charles built another house for her not far from the castle walls. She had two sons from the king. When Charles died, it is said that his last words to his brother were "Let not poor Nelly starve", and his brother made sure that her debts were paid and that she was looked after. Windsor Parish Church is near the Guildhall. There has been a church on this site for more than 800 years. 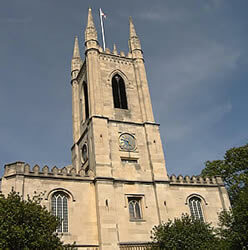 The church which you can see today was completed in 1822. It is dedicated to Saint John the Baptist. 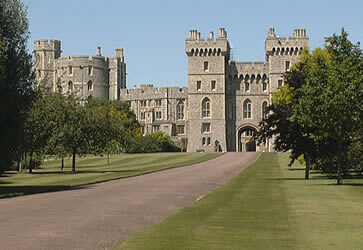 Windsor is located next to the River Thames. 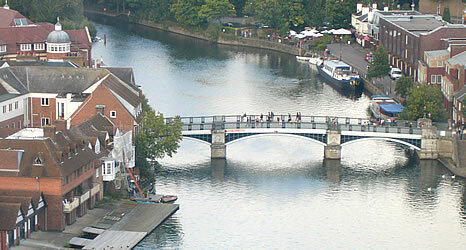 A narrow bridge connects the town with Eton. 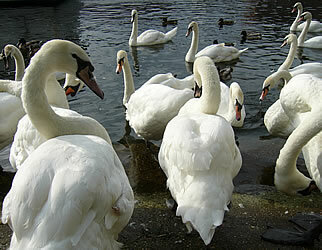 Many swans live on the river. Most belong to the Queen, who takes responsibility for their conservation. Each summer there is a process known as Swan Upping which checks the identity and health of each of the swans, and adds tags to new cygnets (baby swans). 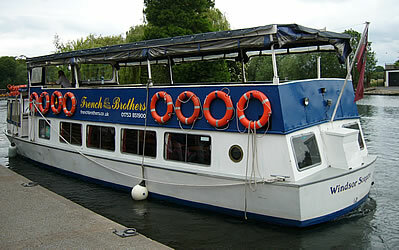 You can take boat trips from Windsor towards Runnymede or Maidenhead. 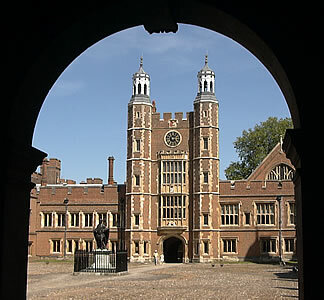 Eton College is the most famous "public school" in the UK (this means it is an independent, fee-paying school). 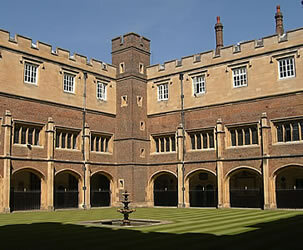 Many famous people went to school there, including both Prince William and Prince Harry. To visit the school you need to pay an entrance charge at the front gate. 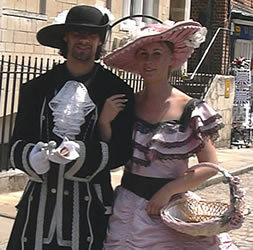 There are regular guided tours which you can join. 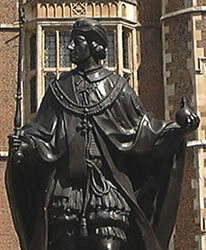 King Henry the Sixth founded Eton College in 1440, one year before establishing King's College at Cambridge University. You can see his statue when you enter the school, in front of Lupton's Tower (this tower dates from 1520). 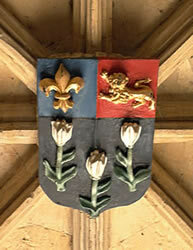 You can see the arms of Eton in many parts of the school. This combines a "fleur de lis" (representing France), a lion (representing England), and three lilies (representing the Virgin Mary - the mother of Jesus Christ). 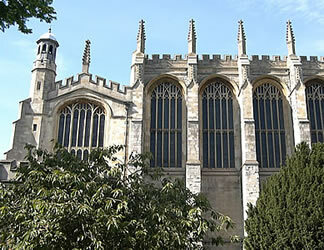 For more background information about studying at Eton, see: Course/Boarding. 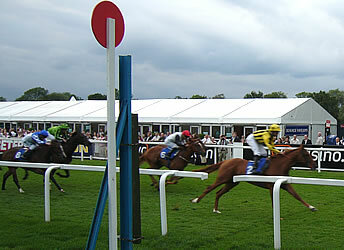 You can enjoy a trip to the races at Royal Windsor Racecourse (the course is owned by the Queen). 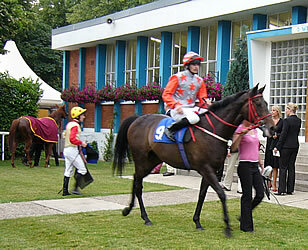 Flat racing takes place here between April and October, including some evening meetings during the summer months. A special boat service is provided from the town centre on racedays. 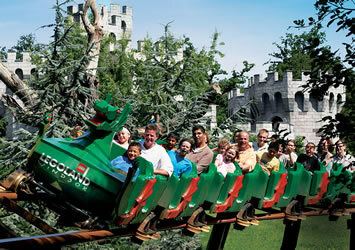 There are regular shuttle bus services from Windsor to Legoland, a theme park based on the popular coloured building bricks called Lego. 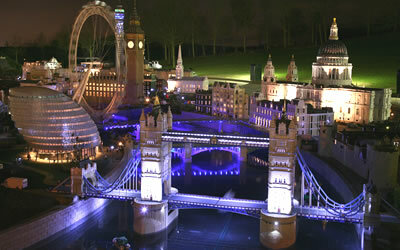 There are a range of models, rides and other attractions, aimed mainly at children. Before Legoland, there used to be a famous safari park (Windsor Safari Park) on this site. 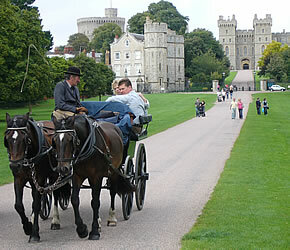 Anderson Tours operates day-trips to Hampton Court and Windsor (starting in London). 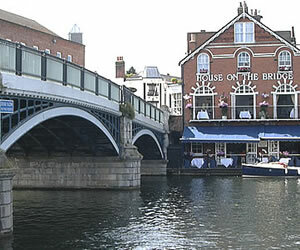 - To travel to Windsor from central London by train, either go from Paddington to Windsor & Eton Central (you will need to change trains at Slough), or go from Waterloo to Windsor & Eton Riverside (the slower of the two journeys). For train timetables and to buy a ticket online, see: Shop/Company/TheTrainline. "Berkshire's prettiest towns and biggest tourist drawcards, Windsor and the adjacent college town of Eton attract the tourist droves that come to visit the extraordinary castle and wander around the prestigious public school"